Order Calendar Cards from Helloprint: cheap, convenient & easy! 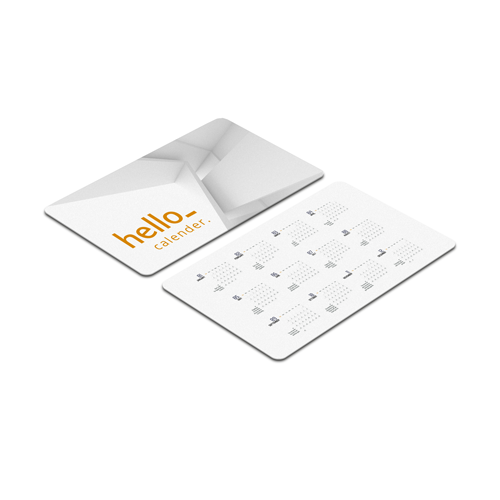 Calendar cards from Helloprint are perfect business cards and pocket-sized calendars at once! Our conveniently sized calendar cards are printed on durable PVC plastic cards with curved edges. They really are a great gift for your customers, partners or acquaintances! Please note: Calendars do not come with a preset month and date design, this needs to be included in the submitted artwork. A calendar card is a plastic card which displays a usefull calendar on one side and personal or company information on the other. It is one of the best ways to impress (potential) customers. For the delivery of your calendar cards we use multiple carriers. Because of the highest reliability, in most cases we use UPS or DPD. The calendar cards that is chosen in most cases can be selected via our website. What type of material are Calendar cards made? Does the calendar card come standard with calendar on it? No, the calendar cards do not come standard with a calendar. Both the calendar, as the design on the back, you will have to design yourself.